Flushing a water heater can help it last longer. Sediment in your water supply, in the form of hard-water minerals like calcium and other small particles, including rust and sand, can damage a gas or electric storage-tank water heater and shorten its life expectancy. And for an electric water heater, the cooler tank bottom that can result from this damage can become a breeding ground for legionella. Most storage-tank water heaters are fairly reliable, but once a tank leaks, it’s time to replace the water heater since a repair isn’t generally worth the cost. To keep your water heater from springing a leak and ensure that it’s working efficiently, flush it a couple of times a year. The beginning and end of daylight-saving time are good opportunities to tackle this basic chore. If you have hard water, you might want to flush your heater more often. 1. Shut off the cold water. 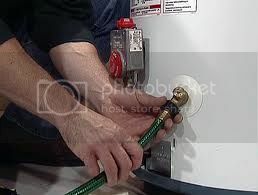 Turn the cutoff valve in the line that supplies cold water to the water heater. Initially, you want the tank to drain without refilling. 2. Open a hot-water tap anywhere in your home. This will allow air to displace the water in the tank and tank drain more quickly and thoroughly. 3. Open the draincock. Put a hose on the draincock at the bottom of the tank and run it to the drain; the drain must be below the tank so it can work by gravity. Open the drain valve/spigot and let the tank drain. The draining water will probably be cloudy at first. Let the water continue to drain for a few minutes after it has turned clear and then shut the drain valve/spigot. Wait a few minutes and reopen the drain valve/spigot to see whether the water remains clear. If it does, go to the next step. If it doesn’t, repeat this process until the water is clear. Be careful: The water will be extremely hot and could scald you. If you don’t have a drain point below the level of the tank, you can drain the tank using the water pressure from the cold-water supply – simply leave the cold water on and do not open any other faucet. Use a hose to route water from the drain valve/spigot to any drainage point. But before you use this method, allow the tank to cool so that any hot water that leaks from a drain hose won’t present a scald hazard. Note that because the cold water entering the tank will stir up the debris from its bottom, flushing the tank might not be as thorough. 4. Refill the tank. When you are finished flushing the tank, close the drain valve/spigot. Open the valve on the cold-water supply line and add water to the tank for a few minutes, then shut the cold water and open the drain valve/spigot. Let the water rinse the tank. If the water runs clear, close the drain valve/spigot and the hot-water tap and open the cold-water supply to fill the tank. Then turn the water heater back on. It the water runs cloudy, repeat the process from step 3. This entry was posted on Sunday, June 9th, 2013	at 10:00 am	. You can follow any responses to this entry through the RSS 2.0 feed. Both comments and pings are currently closed.